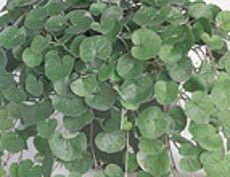 Emerald Falls - Dichondra repens - Annual - Rounded leaf, Full covering, Good ground cover for warm dry climates. Height: 4 inches. Silver Falls - Dichondra argentea - Annual - Silver leaf and stem, Drought tolerant, Good ground cover in full sun. Height: 4 inches.